Christopher Eubanks was born in Atlanta, Georgia on May 5, 1996. With a father that was 6 feet 3 inches tall, and a mother that was 5 feet 7 inches tall, everyone expected Chris to be tall. But no one expected him to balloon all the way to 6 feet 7 inches tall. After an illustrious high school tennis career, Chris would go on to play his collegiate tennis at Georgia Tech. Over his sophomore and junior seasons, Eubanks dominated, amassing a singles record of 65-13, and winning the ACC Player of the year award in consecutive years. Eubanks has also garnered significant praise for his attitude off the court. He treats everyone with kindness and respect, and was awarded the USTA/ITA Sportsmanship Award in 2016. He followed that up with the ITA Arthur Ashe, Jr. Leadership and Sportsmanship Award in 2017. His 2017 year was particularly memorable, with his biggest highlight taking place back home at the BB&T Atlanta Open. Given a Wild Card into the Main Draw, Eubanks entered the tournament ranked No. 461 in the world. In the first round, he faced Taylor Fritz, who was ranked 336 spots above him in the rankings, and prevailed with a 7-6 (5), 6-4 victory. In the Round of 16, he faced the tournament’s No. 8 seed, Jared Donaldson, who was ranked No. 59 in the world. Despite being a massive underdog, Eubanks upset Donaldson in three sets. It was an incredible victory for Chris who celebrated the win by running a lap around the court, high-fiving members of the crowd. Eubanks lost in the quarterfinals to Ryan Harrison, but that defeat could not quell Chris’s excitement about his Atlanta run. “I don’t think I’ll ever be able to kind of put it into words,” Eubanks told New York Tennis Magazine while on Long Island for the New York Open. “To be able to play those matches in front of families and friends and have pretty much so many people from Georgia Tech come out to support me and watch me was an incredible experience, and I’ll never forget it for the rest of my life. Eubanks followed up his run in Atlanta by beating Bjorn Fratangelo and Janko Tipsarevic to qualify for the Western and Southern Open in Cincinnati. Then, Eubanks got an opportunity that he’d fantasized about since he was young. As a kid, the US Open had been Eubanks’ favorite tournament. He had traveled to New York to watch the Open with his family. He had memories of getting a picture with Patrick McEnroe as an 11-year-old, and watching James Blake from the nosebleed seats of Arthur Ashe stadium. 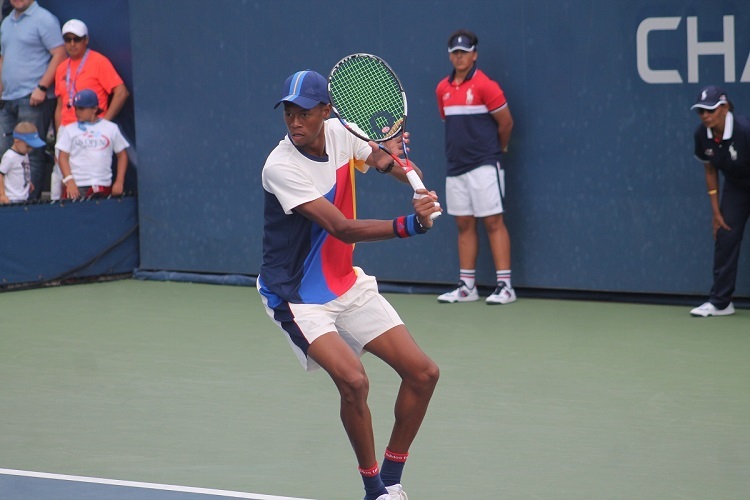 Because of his successful play in Atlanta and Cincinnati, Eubanks was given a Wild Card to play in the main draw of the US Open. Chris faced Dudi Sela in the first round. Sela, the top ranked Israeli, often has boisterous fans cheering him on, and his first-round match against Eubanks was no exception. But Eubanks had a crowd of his own. With so many fans present to cheer on both players, Eubanks said the match “felt almost like a college atmosphere”. After a fairytale summer, the rest of the year was not quite as glamorous for Chris. Eubanks went a combined 3-4 in Futures/Challengers matches the rest of 2017, and was only able to pick up 10 ATP Points. In discussing the transition from college tennis to professional tennis, Eubanks said that on the professional circuit, there’s no such thing as an easy match. In addition to the tougher competition, the professional life can also be lonelier than college. On the ATP Tour, it’s all about you and your individual results. But in college, you share all of your tennis experiences with an entire team. Last October, Eubanks announced that he would turn professional, and would forgo his senior season at Georgia Tech. 2018 is Eubanks’ first full calendar year on the ATP Tour and he started the year by making the finals of a Futures tournament in Los Angeles. After mixed results at Challenger events in Newport Beach, Dallas, and San Fransisco, Eubanks traveled to New York for the inaugural New York Open, where he was kind enough to speak on a panel discussing college tennis during the New York Tennis Expo. After upsetting Taro Daniel, Eubanks fell to compatriot Ernesto Escobedo in the final round of qualifying in a hard-fought three-set match. He will now travel to Cuernavaca, Mexico to play a Challenger event. He will then return to the United States, and attempt to qualify for the Indian Wells and Miami Masters events in March. In April and May, he’ll travel to China and South Korea to play Challengers. 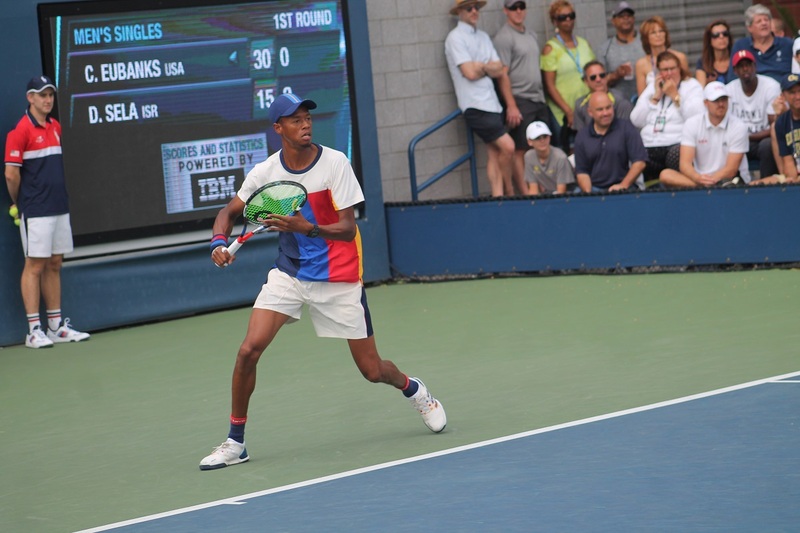 With a massive serve, a powerful forehand, and a maturity well beyond his years, Eubanks is an up and coming American that tennis fans should definitely keep an eye on.